The MK3D format is essentially a MKV file container that has a special field set defining what type of stereoscopic 3D video material is contained in the file, so the MK3D file extension is just to make things more apparent. You can without problems also have a normal MKV file contained with the field set in its header, so that a player can automatically detect and switch to the right format for displaying the 3D content. The stereo 3D support for Matroska video files can be realized with either two separate video tracks – one for each eye, or with a single video track containing both the data for the left and right eye in multiple possible formats. If you are going to use multiple tracks than the TrackOperation field in the header is being used, but more likely you would want to do a single video track as it easier with the 3D content inside it and for that you need to set the StereoMode field. 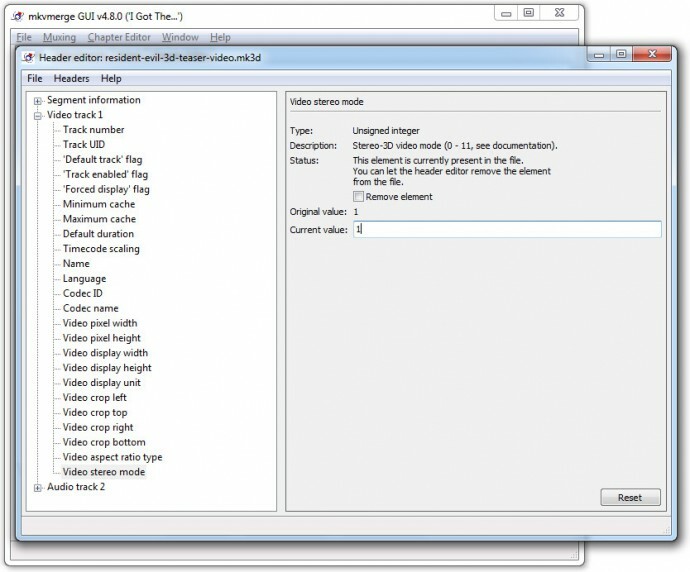 You can set the respective value for the StereoMode field in an MKV file with 3D video that you’ve already downloaded or to apply it to a video you are encoding, so that it would become ready for devices and players that support MK3D to automatically use the right 3D format for the file. For adding the value for the StereoMode field you can use MKVToolnix (available for Linux, Windows and Mac) and more specifically the MKVmerge GUI and the Header editor that the GUI has to make things really quick and simple even for non-advanced users. And just for testing purposes I have for you a short stereo 3D video converted to MK3D (MKV file container with the StereoMode field set to the right format), so that you can just download and test with it.